Show: All ManufacturersCore Products International, IncDexterity Technologies Corp.Maddak Inc.North Coast Medical, Inc. Writing is an activity that we all take for granted everyday, but it can be a very difficult task for a person with arthritis. 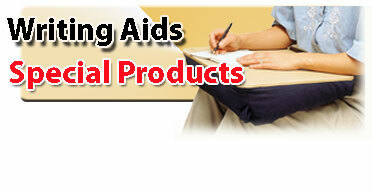 People with arthritis and the elderly have difficulty holding pens and pencils. Our selection of grip pens and pencils can help. The design of these writing aids lets the person get a better grip on the pen or pencil in order to write. Pencil grips are writing tools that adapt to any pen or pencil. The Writing Bird is a unique writing tool that glides across the paper as the person writes. The Lap Desk is a popular product with people who must stay in bed, but need to write. This beanbag lap desk conforms to any lap and the desktop provides a sturdy writing surface. Children love the writing lap desk, too. We have tables to help with writing in bed and book holders to hold books for those who love to read but can't hold a book. All these handy aids have a lot to offer. Give them a try!